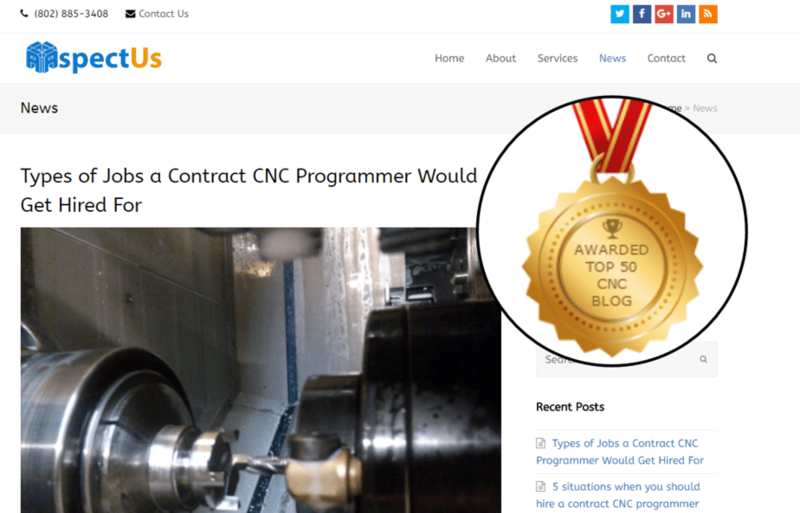 CNC Programming Blog Named "Top 50 CNC Blogs to Follow"
AspectUs, LLC, a company specializing in CNC programming, 3d modeling and fixture design for CNC machines recently was awarded the badge of best blogs in CNC industry. They are listed in the top 50 blogs throughout the world to read and follow. The companies recent success in blogging is due to Glenn Junkins, owner/operator of ApectUs, LLC. After 20 plus years experience in CNC programming and 3d modeling, Glenn decided to launch his own company and fill a large growing need in the industry. AspectUs, LLC adopted inbound marketing principles right away to maximize their online exposure and educate prospective clients about the CNC industry. Feedly contacted us through email announcing that we were one of the winners in the top 50 blogs worldwide. AspectUs owner, Glenn was naturally surprised and delighted that his company reached this status so quickly. Feedspot is a modern RSS reader that helps people keep up with the super fast pace of ever changing new throughout the world. Millions of customers use feedspot to keep up to date with their favorite blog feeds. Feedspot scours the internet looking for active websites that utilize social media and blogging effectively.